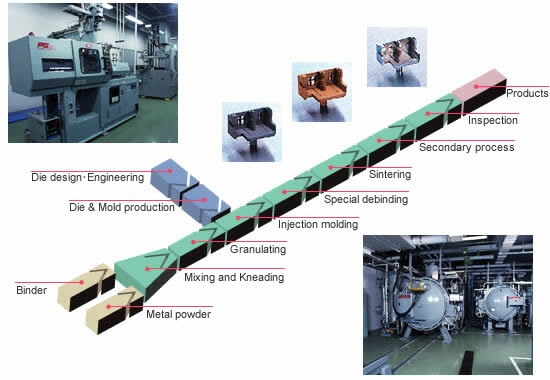 Representing one of the advanced metal processing techniques, MIM (Metal Injection Molding) was created by fusing traditional plastic injection molding technology with powder metallurgy. Injection molding using metal dies makes it easy to manufacture otherwise hard to machine parts, including micro, precision, intricately shaped, and 3D parts. MIM is also superbly suited for mass production, as demonstrated by our ability to manufacture at rates ranging from 5,000 to 1 million pieces per month. MIM works best for parts that weigh around 0.1 g to 50 g, but it can also mass-produce parts weighing up to approximately 100 g.
Jiangsu Tech began manufacturing and selling parts based on Metal Injection Molding (MIM) in 2004. We have been quick to pursue quality and cost development in this area, and we have endeavored to reduce the cost of metal part manufacturing. Moreover, we have successfully enhanced the stability of MIM based mass production by partnering with a metal powder manufacturer to develop parts made with high precision powder. are provided in this order. MIM (Metal Injection Molding) is a totally new, 6th processing technique. Complex shape Complex shape metal parts can be made in near net shape. shape design Horizontal holes and grooves can easily be made in 3-D.
Parts in shape not existed before and those used by combining multiple parts can be designed in a unified form. Mass production Like plastic molding, MIM is suitable for multiple molds and robot-used production. Precision High grade powder can be used to get molds with uniform precision and less distortion and so put into high-density and high-rigidity products. Difficult processing materials Difficult processing materials such as SUS, Ti and W alloys can be molded in near net shape for reduced processing manhours and adding value to the products. Cost Near net shape can provide energy saving after processing, leading to cost down.